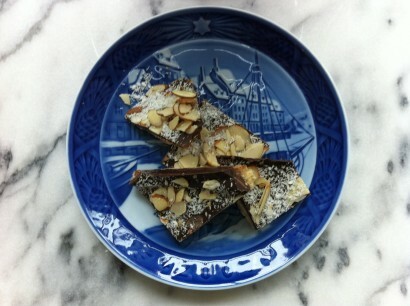 For the past several years I have made this recipe for chocolate almond bark. It is by far my favorite confection to make for Christmas gifts. This year I flubbed miserably on the first two batches and burnt the toffee. It was barely edible, but my family was happy to oblige and devour the rejects. I realized a bit too late on the second failed batch that my candy thermometer was on the blink and that I should have trusted my eye as to the color of the bubbling toffee for the right time to pull it off the heat before it was burnt. It wasn’t scorched beyond use, but it wasn’t presentable for gifts. This morning I took another go at it leaving the now-known-to-be-broken candy thermometer in the drawer. That was my best strategic move as I watched the pot like a hawk and made my move at just the right moment. 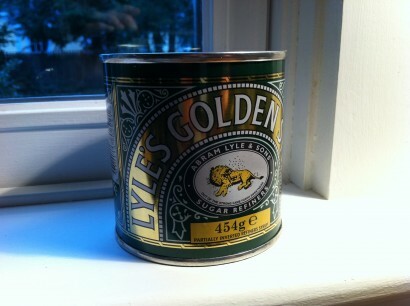 I like anything that includes Lyle’s Golden Syrup in the recipe, not because of the taste, but I love the color of the syrup and the empty cans are great for all sort of things-pencils, paperclips, short knitting needle storage and it makes me feel as though I were cooking in Britain somewhere in a country house as opposed to my everyday kitchen. (Sort of a transporting experience- lots of value added to one little can of syrup). Here goes. Be sure to have all of your ingredients measured and ready to go before you begin to cook the toffee as the last few minutes of the preparation require a few steps to be done quickly. Toast the almonds: Preheat oven to 350 degrees F. Spread almonds on a half sheet pan and toast for 8 minutes. Allow to cool. Then pulse in a food processor with a metal blade to a fine chop. Cover a half sheet pan with parchment, spray with cooking spray. 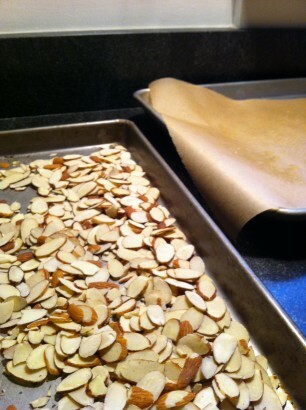 Spread 1/2 of the chopped almonds in about an 8″x10″ rectangle on the parchment. 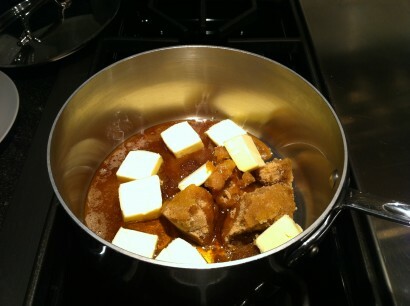 Cooking the Toffee: Combine brown sugar, water, butter and syrup in a heavy bottomed, medium saucpan. Stir just to dissolve the sugar. Bring to a boil and with a candy thermometer attached to the side of the pan, but not touching the bottom, cook without stirring until the temperature reaches 280 degrees. Watch the color of the molten toffee and remove if from the heat when the color deepens and just begins to show a tiny hint of darkness also known as the hard ball stage. IfRemove from heat and immediately stir in baking soda and vanilla. 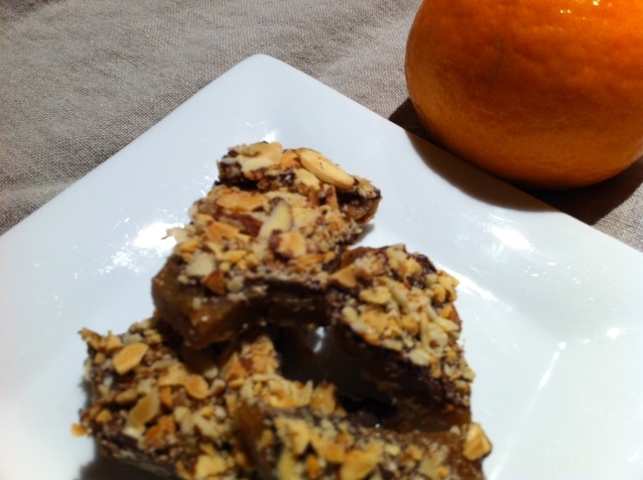 Making the Bark: Pour the hot toffee over the almonds that are spread on the parchment. 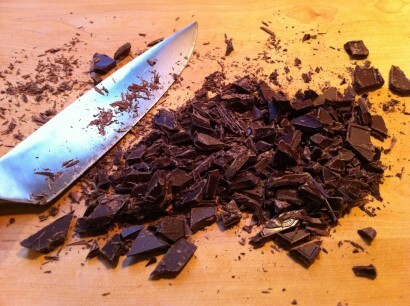 Then sprinkle the chocolate over the hot toffee using the back of a spoon to spread, top with the remaining chopped almonds. Sometimes I also sprinkle on some coconut at this stage, but that is completely optional. Place in the refrigerator about 3 hours to cool completely. Then cut in pieces with a knife. Store in an airtight container in the fridge for about 10 days or eat immediately with your family and best friends.